So that was that. 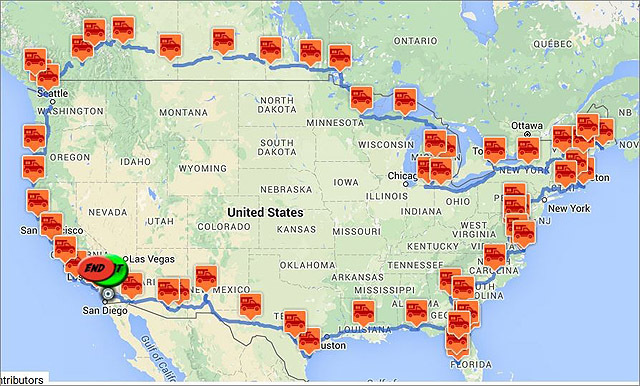 (Have a look at our route map) The perimeter of the lower 48 states of the United States is somewhere in the region of 12,100 miles but we managed about 18,000 with tourist trips and the like. We had to drive in to Canada for part of the trip because we were running out of time on our visa so we got to see some of the prairies before taking the ferry over to Vancouver Island. Once we were back in the USA we headed south down Highway 101 which follows the coast of Oregon and California making a few stops on the way to visit with friends. A couple of unplanned stops can be seen in the pictures below. We’re now sitting still for a while in the back yard of a friend, not too far from Newport Beach. 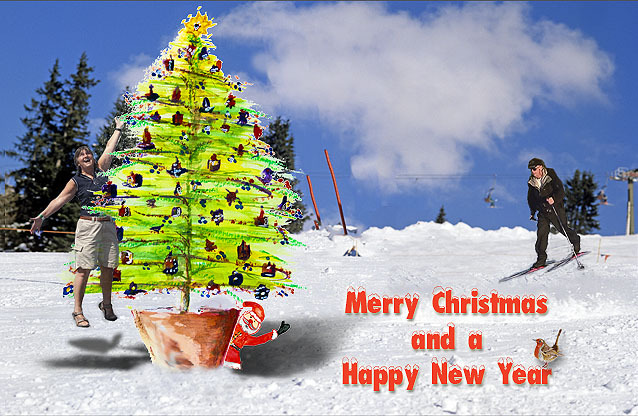 The only thing now would be to wish everyone all the best for the coming year. Congratulations on completing your circumnavigation – what’s next? Happy Christmas to,you both. Hope to catch up with you again sometime soon. Awesome card! Good work, whichever of you did this! Merry Christmas and Happy New Year to you both, too! Perhaps we can get a Skype in sometime over the season! So nice to hear from you. Saturday we’ll be in San Diego to watch the lighted boat parade. Hope you stop out at the Ranch. We wish you both a merry christmas and a happy , healthy new year.Love from Ray and Lynne.